Born in December 1905, Alfred's most vivid impression is of growing up through hard times and a level of poverty which meant everyone went barefoot in the sum­mer. Anyone lucky to own a pair of boots kept them for the winter. 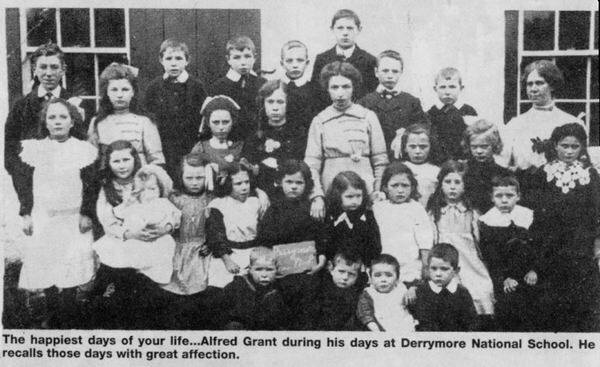 Alfred's childhood was spent on a family farm at Derryanish just a few miles from his pre­sent home at Brankinstown Road off the shores of Lough Neagh. Though times were tough, especially for those living in the country, but Alfred remembers life for the people then as easy‑going and happy nonetheless. He loved school, in his case Derrymore Primary, where he was taught the times tables, English and Maths. Derrymore was one of the few schools that used jotters as well as slates. 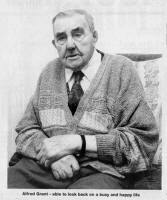 He walked to and from school each day where he and 23 other pupils were taught by teacher Mrs. McKee. "School was great," said Alfred. "I loved going to school every day. "It was nothing like the way it is now. The pupils had a lot of respect for their teachers. Mrs McKee was our teacher and we thought an awful lot of her. "Like most teachers of that time she would use the cane - and sometimes used it on me - but we all still admired her. "There were no uniforms but the boys wore short trousers and all the girls wore skirts. I also wore a blue bow tie." After school Alfred used to run all the way home knowing his mother would be keeping his dinner warm on the coal stove. And sure enough there on the hearth would be six plates - one for each of the family - all lined up and piled high with eggs and potatoes - a family favourite. On leaving school at 14 Alfred got a job at Geordie Grant's farm and because it was several miles away at Crewe Hill he was told he would have to board there. Glad of work. he left home to milk cows for a wage of £16 for six months, working from 5.30am to 6pm each day. On his first day Alfred recalls being brought to his room and the farmer being delighted to hear he did not smoke - not so much from concern for his health as anxiety that the thatched cottage might be set alight! Later that day, the first he had ever been away from home, Alfred began to feel homesick. He remembers running out into the garden of his new home and climbing as high as he could up an ash tree to see if he could spy his home in Aghalee. Alfred can still recall becoming emotional on dis­covering he could not see his house and only barely glimpse Lough Neagh, but at least he knew his home was not far from that body of water. He lit the candle given to him by the farmer and went to bed early. Alfred left that job after just six months and returned home and then worked briefly at other farms. However, eager to get himself a skilled job Alfred turned his hand at basket making. It was at Mulholland's factory at Aghagallon, just a few miles from his home, that Alfred learned the basket making trade and took his place among the 34 workers employed there. He stayed at the factory for 20 years before chang­ing job again to that of village postman. He was never given a bike to use and instead had to walk every day in all types of weather delivering the mail o each house. "You had to wear your own clothes, there was they become." never a uniform. "But I enjoyed listening to all the gossip and would always be invited into a house for a cup of tea and a chat. There is nothing as good a having great neigh­bours and friends. If you don't have good neighbours or good friends you don't have any­thing. "People were much more friendly back then than they are today. They would always have time for you. I think a lot of it has to do with education. The more people learn the more unfriendly they become." Entertainment in those days for Alfred meant a walk to the nearest dance hall, or a lengthy cycle journey to a hall near Crumlin where he met his future wife. They had three children Thomas, John and Sadie. 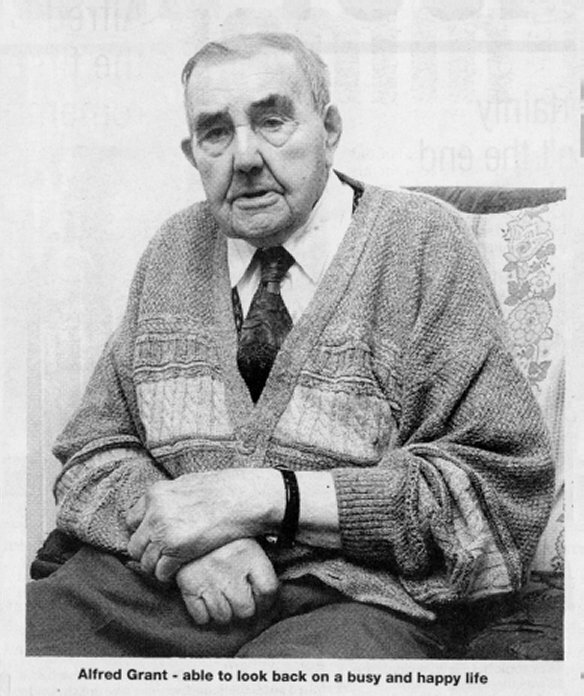 He retired as a postman in the 1970s after 34 years of service. In the meantime, he had become a skilled hairdresser who continued to cut people's hair up until a few years ago. The idea, Alfred said, came to him as an inspi­ration from God some years ago whilst he was in church. "I was at church in Soldierstown one Sunday praying," he explained. "It was then I got this idea for cutting people's hair. I think it was God telling me something People think I'm making it up when I say it, but it's true. The idea came to me when I was at church. In fact people came from far and wide to Alfred's house to get their hair cut for 3p a shot, and in time the business did so well he was forced to build an outhouse at the back of his house to accommodate demand. Looking forward to the millennium Alfred said he hoped it would bring peace and happiness to Northern Ireland. "To think in this century we have had people walking on the moon and a lot things that have been invented like the TV and computers which make life easier, but they don't always make people happier. "I think there will be very interesting times ahead when the millennium comes," said Alfred. "We wouldn't have believed what would be invented when we were growing up so who knows what will come in the next cen­tury.